The Internal Revenue Service (IRS) tracks migration data for taxpayers at the county level. For each county, the IRS calculates the inflow and outflow of tax returns, number of exemptions and adjusted gross income. 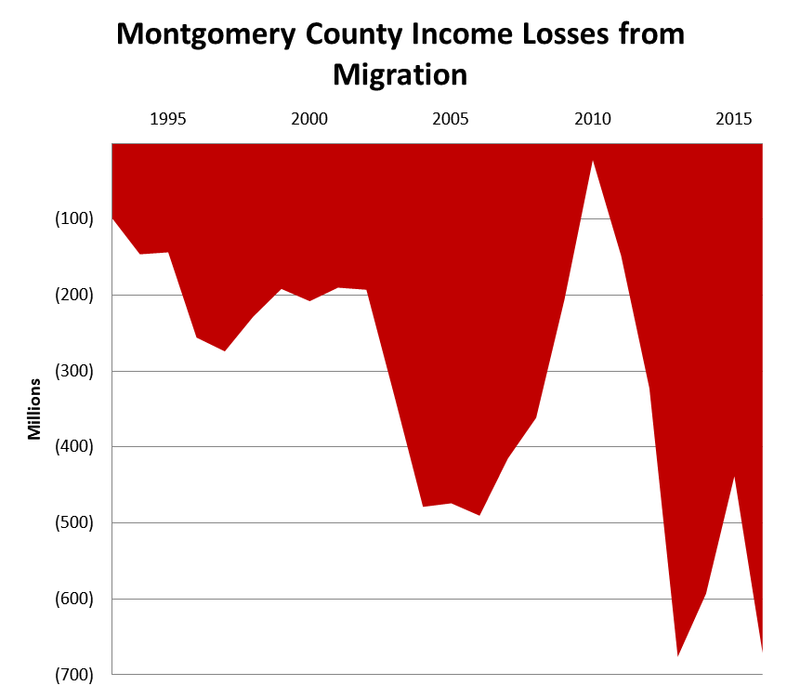 Since 1993, when the data series began, MoCo has lost more adjusted gross income than it has gained in every single year. In the 1990s and early 2000s, the county lost roughly $200 million a year. After rising and then falling during the recession, the county has lost more than $500 million annually in three of the last four years. Below is the amount of adjusted gross income gained and lost from other jurisdictions between 2011 and 2016. 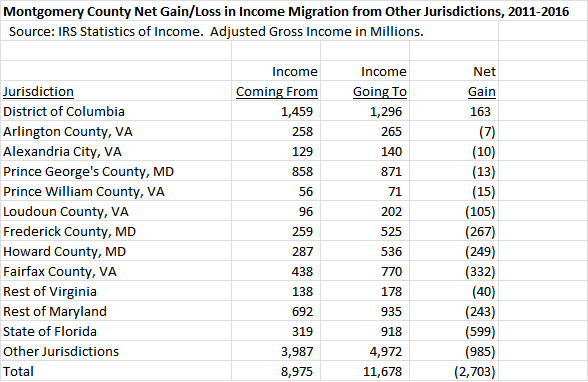 Of MoCo’s large neighbors, the only one with whom it had an income gain from migration was D.C., from whom it acquired a net $163 million in taxpayer income. MoCo lost income on net to Arlington, Alexandria, Prince George’s, Prince William, Loudoun, Frederick, Howard and Fairfax. Over that period, the adjusted gross income of tax returns migrating into MoCo was $70,310. The adjusted gross income of tax returns leaving MoCo averaged $81,640. More income has been leaving our county than coming in for many years. That’s bad for our county budget and our quality of life. Montgomery County needs to become more competitive for both residents and businesses or we will pay the price.